Chia seeds (Salvia hispanica L.) are an increasingly popular super food. Natural from South america, they are also grown in Australia and other parts of the world, due to their excellent nutritional value. 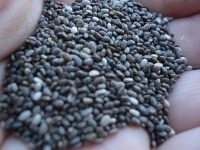 Efeito Verde, Lda has been supplying Chia Seeds in the last few years, under the trademark Midzu. We supply distributors and retailers directly, and also consumers through an online store, offering quality service and selected products. Learn more and order online.